Over the last couple weeks, our integrations team has been hard at work making some major updates to some of our CRM integrations. Below you will find a brand new integration and a few awesome updates to our Capsule, Sugar, HubSpot CRM, and Google Add-on integrations. With the help of our PandaDoc Partner Velvetech, PandaDoc is excited to announce the launch of an integration with bpm’online CRM! Bpm’online provides a unique synergy of BPM technologies and CRM for sales, marketing, service to empower organizations to accelerate time-to-strategy execution. The core value of bpm’online products is the agility to change processes faster than ever and align marketing, sales and service on a single platform. Users love bpm’online’s engaging interface with a social look and feel, free from redundant information to keep them focused on what’s relevant. With the bpm’online and PandaDoc integration, you can now create, send, track, and eSign quotes, proposals, and other sales documents right from the CRM. There is no need to leave the platform to create a document. The integration provides bpm’online users with powerful PandaDoc analytics, so you can see how your prospects are interacting with your documents. Secondly, we’ve included the ability to merge data from bpm’online to automatically populate your docs with contact, account, and product information – reducing costly errors. We’ve released a new version of our Chrome Extension for our Capsule integration. This new version allows the integration to work with Capsule API version 2.0. We’ve also fixed some previous token issues and expanded some tokens to offer additional info that can be populated into your docs. We are happy to announce that we’ve made some valuable updates to our Sugar integration. After a few customer requests, we’ve modified and updated the integration so that it functions in the Quote module just like it does in the Opportunities module. Within Quotes, you can now generate a document and populate it with the quote line items from Sugar into a PandaDoc pricing table. We’ve also updated the related object tokens. Previously, you could only pass contact information but now you can pass account related information directly into your docs from an Opportunity. Lastly, when you start a document from a Contact, it will make sure that the contact info is passed as a document recipient, allowing you to assign any roles to that document. 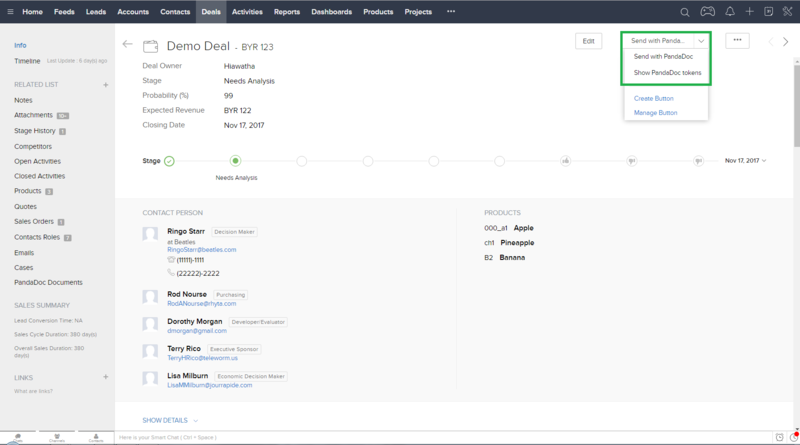 The latest version of our HubSpot CRM integration now features an option to show all documents created by all users within a workspace. 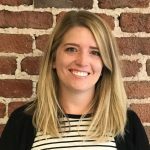 By default this option is unchecked, but when enabled a user can see all of the documents created by any HubSpot user – not just the ones created by the document author. 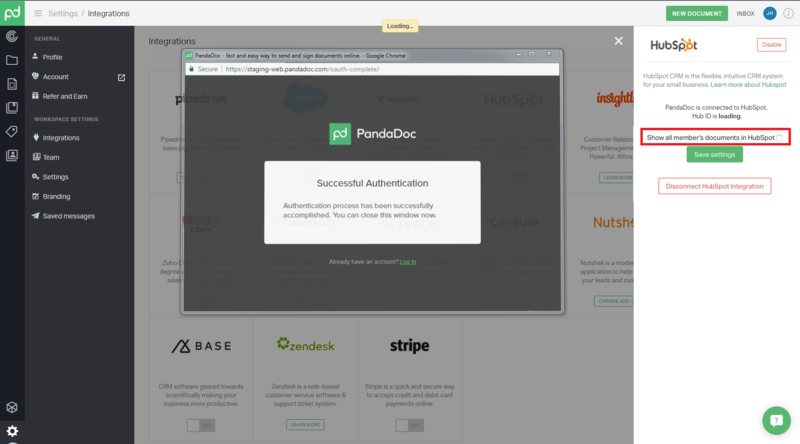 PandaDoc is thrilled to announce that we’ve also built a native integration with Zoho. Create PandaDoc documents within Zoho CRM for Accounts, Contacts, Deal/Potential, Lead and Quotes objects. Use your Zoho CRM “Contact Roles” to merge contact information directly in your documents via PandaDoc Template Roles. Send Zoho CRM fields and custom fields data to PandaDoc via tokens and textfield fields. Use Deal/Potential and Quote “Product” information to send to PandaDoc pricing tables. 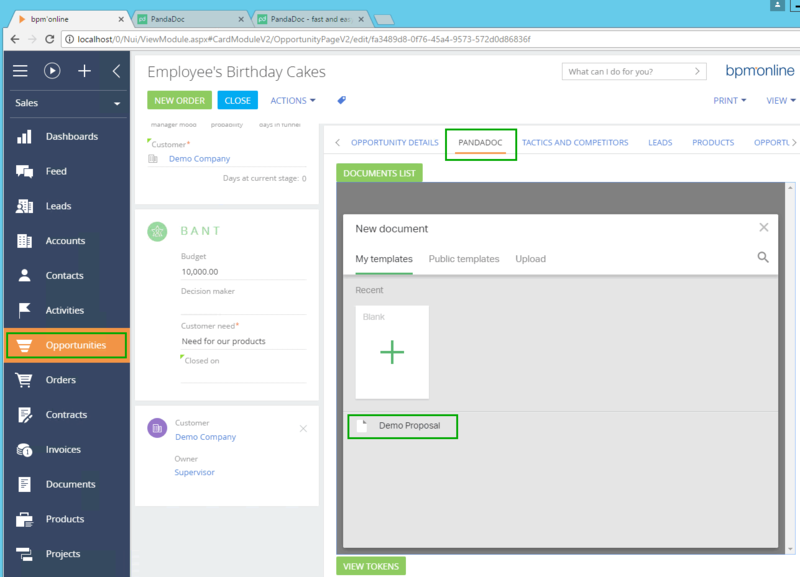 Track PandaDoc documents directly inside of your Zoho CRM object. We’ve also made a couple updates to our Google Add-on integration. The Add-on allows for three basic options. The first is the ability to sign a document. Maybe you have a form you frequently use and all it needs is a signature. Simply copy a signature into your doc and send it off. Second is the ability to add additional recipients to a document. Maybe that same form also needs to be signed by someone else. You can also add additional fields to the doc like a text field for your recipient to fill out additional information. Third is the ability to preview your document. When you are ready to finalize it, take a last look at your document and make any necessary changes, then click Preview and send via PandaDoc. And if those updates weren’t enough, Google just introduced new templates that are paired with add-on functionality, so you can easily customize and deploy the best tools for your organization’s workflows. Now, you can choose from new templates that already contains add-on functionality, or create your own custom templates and pair it with the PandaDoc add-on to get the signature you need. The Add-on is available through the Google Drive Store. You can also access it right in your Google Doc by heading to Add-ons in your navigation bar, then Get Add-ons. Well, that’s it for now. Stay tuned to our blog for more integration announcements and updates in the future.